Mid Beds Tyres are here to help! Ensuring the tyres on your company vehicles stay safe and legal is a continuous job- let us take away the headache. Call us today to discuss your needs, anything from a one-off fleet check to a complete tyre maintenance package. Mid Beds Tyres offers a range of services, and by discussing your needs we will work to find a solution tailored to meet and exceed your exact requirements, within budget. Regular, scheduled fleet checks are key in keeping your company vehicles safe and compliant. By noting and fixing small problems as they arise, the life of your tyres could be significantly prolonged- ultimately saving you time and money. Minimise any down time for your vehicles: We ensure any required maintenance work is carried out in a timely and proper manner to fit in with your schedule. Complete paperwork is always included, making sure your records are correct and kept up to date. Benefit from our expertise and knowledge! By monitoring your fleet we can help you evaluate and manage the risk, and even assist with planning for future costs. There is never a good time to get a flat tyre! Call us 07860 409600 and we can provide roadside tyre replacement to make sure you are back on your way as soon as possible. Mid Beds Tyres will find the best tyres for your needs, at the best price. Budget, mid-range or premium, we will find the best options for your requirements. Puncture repair, wheel balancing and wheel alignment are all key areas we can help with. We can advise on ways to help maintain and prolong the life of your tyres- our advice is always free! Plan ahead and get in touch with us! Give us more time to find you the best solution and we may be able to get you an even better deal! "We have been using Mid Beds Tyres for approx 18 months now, the service we receive is 2nd to none, the knowledge and skill of the fitting staff, the competitive prices and the excellent level of service we receive are faultless. I wouldn’t hesitate recommending Mid Beds Tyres to anyone." "Many thanks for your on-going, fast and efficient service. Paul and the Mid Beds Tyres team are always friendly and on-the-ball. Any tyre issues with our large fleet of trucks, plant and machinery are dealt with swiftly, whether it be day or night to ensure that smooth operations continue at all our busy waste sites. 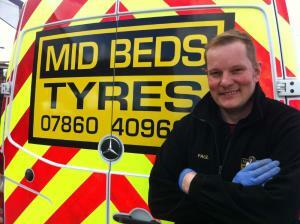 I would highly recommend Mid Beds Tyres for a professional and reliable service."